Disclaimer: This post is from 2017, please check dates and times to ensure accuracy in making your Halloween plans. Legend says that one night a car full of rowdy teens were driving too fast coming up to the fateful bridge, and hit an oncoming car. Both cars caught on fire and crashed into the river, killing all involved. The road and bridge have since been closed off, but can now only be accessed by walking through the park. Legend says the dates and names of those who died can be seen glowing in the river late at night. 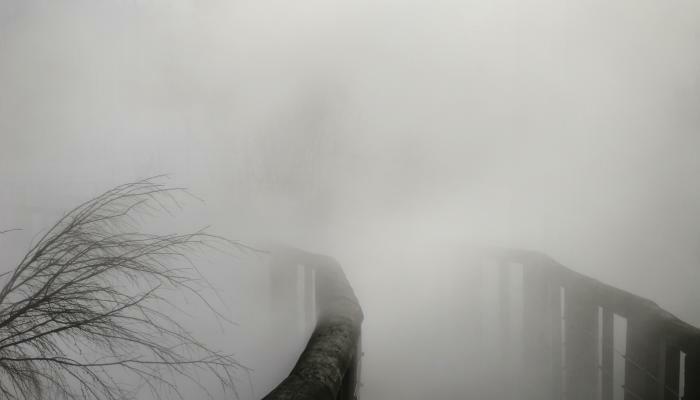 *shiver* People have also witnessed lights on the bridge, as well as mystic fog and experiencing “strange” feelings. There is a trail at River Legacy that leads up to two menacing old fence posts. It is said that the gate which used to stand there was the last thing captured Union soldiers saw before being hanged by the Confederacy during the Civil War. Some say you can hear the sobs of those fated soldiers as you approach Hell’s Gate. Others say you see a redheaded man in a confederate uniform standing guard there. Like the screaming bridge, people feel quite uneasy while visiting this spot and have felt the sensation of someone watching them, heard weird sounds and sometimes disembodied voices. Once again, this phenomenon is said to be better when visiting Hell’s Gate at night. Have you heard of Annie? – According to legend, Annie lives in the Texas section of the park. She is said to be the spirit of a little girl who died in or near Johnson Creek in the early 1900s. Annie is said to be a very friendly spirit that is as mischievous as she is notorious. She has been seen by SFOT employees in the past turning the lights on and off in “her room," located in the yellow house near the entrance to the Texas Giant. Some have also seen and felt her in Runaway Mountain –although it&apos;s so dark their eyes could be playing tricks on them? If you believe in Annie, visit her during the spookiest time of the year for Six Flags Over Texas – during Fright Fest, running thru October 31! Back in 1894, society was a different place where single mothers were, for lack of a better term, social pariahs and shunned from the general public. That’s when Reverend James Tony Upchurch created the Berachah Industrial Home for the Redemption and Protection of Erring Girls. Here, the women were taught employable skills that could help them rejoin society. The Institute turned into a “self-sustaining” village that eventually morphed into an orphanage by 1935. The only thing that remains of the land Reverend Upchurch developed is a well-hidden graveyard right of UT Arlington’s campus. The “lost cemetery of infants” most likely marks the graves of stillbirths and complications, as most of the women in the Berachah were unwed mothers. “Fred” is the name of the ghost-in-residence owner Jean Collins has come to know over the past 6-7 years at Arlington Music Hall, Arlington’s 65-year old Downtown music venue. Not only did she catch the disembodied sounds of something walking onstage with her own ears, but she and countless other AMH employees are dead serious when they tell you lights have come back on after being completely shut off. Howard Ball of AMH’s next-door neighbors Babe’s Chicken Dinner House also recounts strange occurrences, including Fred himself walking up to him and asking for a look around the restaurant, stating that “he used to live here,” only to then disappear. Ahh! Even the Dallas-Area Paranormal Society caught clear EVPs (electronic voice phenomenon) and the conclusion that there may be more than one spirit that roams the hall, as a female voice was also recorded with the team. “Fred is a good ghost, and he’s here,” says Jean. Note: A large part of the area where we are located once was near-or-on location of the Arlington Downs horse track in the 1920s and 30s. Many people, myself included, are drawn to what goes bump in the night, especially around Halloween. However, when that bump happens in your place of work, the place you spend most of your time, it’s time you call the ghost busters- aka NT Paranormal. There were some things that could be explained, like tapping on the wall and loud bangs from the air conditioner and sometimes hearing voices -very prevalent if there&apos;s a game let out with people talking all around your building! However, what couldn&apos;t be explained was the TWO electronic voice phenomenon (EVPs) captured as well as odd-moving orbs captured on camera. The scariest parts were the technical malfunctions - at one point an investigator asked whatever we&apos;re dealing with to mess with her, and she heard a button click and her camera shut off, ruining her current and future footage for the investigation. Other cameras integral to the investigation, including our security cameras, had stopped recording that night! Shiver. Are we haunted? I think so, but you decide. In the middle of the legendary Stockyards, Miss Molly’s Hotel was first an upscale boarding house for sick children, then a speakeasy called the Oasis until the 40s when it became a place where wayward gentlemen could visit “working girls,” which opened the most tragic era of the hotel. Now a bed and breakfast, the place has been teeming with paranormal activity including strange perfumes, unexplained shadows and lights, cold spots, missing items turning up in weird places, old coins on furniture, etc. etc. Ghosts that have been seen include: a few female apparitions of supposed murdered prostitutes that don’t even know they’re dead, a woman who died of lung disease and the mysterious Cowboy who shows up in the Cowboy Room. There’s even a child ghost, believed to be one of the sick children once boarded here. The cool thing is, travelers can still stay here! There are two separate ghosts here. One is believed to be a former elephant trainer that sadly met his tragic death in 1987 when he attempted to move a territorial bull to another pen. Since his death almost 30 years ago, many have seen the ghost of a man walking near the elephant and zebra areas of the zoo, just as the elephant trainer used to do as he made his rounds. Many others have also reportedly seen the ghost of a woman dressed in clothing of the late 19th century, parasol and all, pacing slowly back and forth in front of the zoo’s café. Established in 1907, the Stockyard hotel has seen a lot of rowdy outlaws, country legends, ghosts and haunting in its almost 100 years. First off, the elevator is said to be haunted (it sometimes ascends and descends on its own), possibly by the specter of a young girl that gets off on the second floor, takes three steps then disappears. Room 306, a suite notorious outlaws Bonnie and Clyde once stayed has a water faucet that likes to turn on and off on its own accord. Women staying alone in the hotel have reportedly felt the presence of someone next to them or getting into bed with them that isn’t there. TVs and radios turn on by themselves. There have even been prank calls from within the building, mostly believed to be from an old employee, who most likely doesn’t even know he’s passed. This gorgeous castle off Lake Worth was originally built in the 1860s for a young man as a gift to his young bride. As legend has it, the day of the wedding was a tragic one as the bride was found floating dead, face down, in Lake Worth. It was never determined if the death was a murder or accident, but a month later the young man was married to the dead bride’s sister. As time passed, many people would see the apparition of a young woman in a white dress, running from the house and disappearing as she got to the lake’s edge. Then, in the 20s it was acquired after a high stakes poker game by the Whiting family. Within a year, the Whiting’s young son committed suicide there, followed by a fire that ruined most of the property. The property has still been standing almost 150 years later and was eventually sold to the city to make way for the Lake Worth project. It’s now boarded up, fenced off and completely spooky to all who pass it. Over 25 years ago, strange happenings shrouded the Grand Prairie location. One murder, one believed murder and a fire that melted 300 wax figures (figures that took 25 years to accumulate and the largest collection in the country at the time), costing $4 million. No deaths occurred on the premises, but the former co-owner was poisoned with strychnine, and her young assistant died mysteriously of natural causes. The fire, believed to be set by a shady and wanted arsonist, might have been set to blackmail the museum. Although Ripley’s staff swears up and down that nothing spooky has happened to them, it is still spooky to know what’s gone on there in the past. One of the swankiest hotel destinations in Texas is also famed as one of the state’s most haunted spots, chiefly because of ongoing reports of an apparition who appears in a 1930s-era white wedding gown—the spirit of a jilted bride who was supposed to have been married in one of the hotel’s glamorous ballrooms, but ended up taking her own life at the hotel instead. Not all ghostly Adolphus residents have such sad backstories, however—in fact, many are believed to be former guests who checked in again during the afterlife because they had such a good time at the hotel back in their days among the living. Besides being a great choice for a scenic walk, pretty Coombs Creek Trail in Oak Cliff’s historic Kessler Park neighborhood is the purported home of a ghostly little girl, an unfortunate victim of a creek drowning, who has been seen riding her bike at night before seeming to vanish. This delightfully vintage concert-and-dancing-venue in Deep Ellum has been the scene for some swingin’ good times for more than a century—as well as its fair share of ghostly occurrences, like falling paintings, mysterious slamming doors, unexplained children’s laughter, and phantom footsteps. It’s almost impossible not to experience a deliciously eerie shiver down your spine as soon as you step into the wonderfully authentic Millermore Mansion, a Civil War-era mansion that’s said to be haunted by an unidentified lady ghost who always seems to lurk near the nursery. Many Millermore visitors have also reported unexplained cold spots and a distinct feeling of “being watched” during their visit. If you don’t get too scared during yours, stick around afterward to check out the rest of Dallas Heritage Village, home to the largest collection of 19th-century commercial buildings and pioneer/Victorian homes in Texas. The brooding natural beauty of White Rock Lake is perhaps at least partially accountable for its status as one of Dallas’s most haunted locales. Noteworthy lake legends include the infamous Lady Of The Lake, a mysterious young hitchhiker attired in vintage formal wear who disappears from vehicles before reaching her stated address; and tales of the lake’s Flag Pole Hill area, home to some stately-but-spooky houses and an alleged band of rock-throwing apparitions. Granbury is frequently credited with being one of the most haunted cities in Texas, as well as an excellent destination for anyone who loves fishing, boating, shopping, and dining. Some of the town’s most famous spooky destinations include the Granbury Opera House, Nutt House Hotel, and Last Mile Cemetery, many of which are stops on Granbury’s popular Ghosts and Legends Tour. In the pre-World War II era, the fashionable Baker Hotel was a preferred destination for well-heeled guests (including A-list movie stars like Clark Gable and Judy Garland) drawn to Mineral Wells’ famous “healing waters” and the hotel’s equally-famous lineup of luxury modern amenities. In later years, the Baker Hotel became better known as a site for ghostly goings-on, including unexplained sounds of a distant dinner party, orchestra music, high heels clicking on a corridor, and sightings of a bloody woman said to be the once suicidal and distraught mistress of the former hotel manager. When they’re not dishing up some scary good Southern cuisine, employees and guests of the Catfish Plantation have long told tales of a plethora of spooky occurrences said to have occurred at the famous restaurant, including flying dishes, a mysterious rose fragrance, broken clocks that still manage to chime, disembodied voices, ghostly writing, and unexplained flickering lights. Others have reported being touched by a “flirty gentleman ghost” who apparently still likes to chase the ladies, and sightings of Caroline, a former owner of the converted Victorian-era home who sometimes gets a little miffed when people won’t get out of her kitchen.